This development of rank-and-file independence from the trade union leadership and from orderly collective bargaining in the late 1960s/early 1970s in US, in addition to the national postal workers' wildcat strike, was also well illustrated in the 1970 Teamsters wildcat. After what was described as the "most orderly series" of negotiations in Teamsters' history - credit for which management officials gave to acting Teamsters President Fitzsimmons1 - union and management agreed to a new contract granting $1.10 in wage increases over thirty-nine months. Strikers here have set up a roving patrol system that they say can muster 300 men within an hour to stop any truck moving goods in the area. The strikers are allowing trucks carrying food, drugs and beer to continue, but they have become outraged when they have found food trucks carrying other cargo. As the wildcat spread, acting Teamster President Fitzsimmons sent telegrams to 300 locals, urging members to return to work.7 (Fitzsimmons had pledged, "We will never tie up the over-the-road freight operation of this country. "8) A spokesman for the employers vowed, "We'll stay out till the snow falls" rather than accept the rank-and-file wage demands, and stated that the Teamsters union was "standing by" the agreement it had negotiated.9 Local and national Teamsters officials unanimously endorsed the agreement, and the director of the Federal Mediation Service issued a statement urging all striking truck drivers to return to work pending a vote to ratify the contract-all to no avail. Helmeted troops, armed with M-1 rifles, were stationed in pairs on some overpasses, while other Guardsmen rumbled along on patrol in quarter-ton trucks. Guard officers said their men were also guarding truck terminals and, in response to requests from truck companies and the state police, had escorted about four convoys of from 5 to 20 trucks. 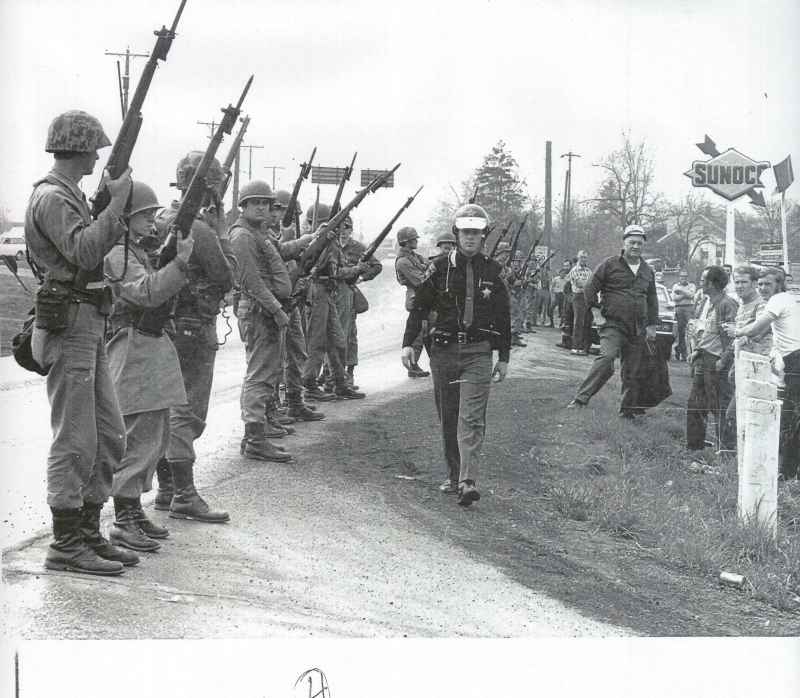 The 145th Infantry-which had intervened in four or five ghetto riots in the previous two years and was soon to be rushed to Kent State University - patrolled west of Akron, where a number of truck terminals were operating in defiance of the strike. They sought out and neutralized the strong points, identifying two bars where striking teamsters hung about and from which they poured out to heave everything from invective to rocks whenever trucks moved out of nearby terminals. The National Guard simply set up squads to meet the Teamsters as they rushed out. Despite the combined opposition of union, employers, courts and military, the strike held firm. After twelve weeks, employers in Chicago capitulated, undermining the entire national contract, forcing a wage increase two-thirds higher than union and management had originally agreed to.16 This victory in turn strengthened the resistance of workers throughout the society to the policy of solving current economic problems by holding down wages. Excerpted and slightly edited to make sense as a stand-alone text from Strike! - Jeremy Brecher. 1. Wall Street Journal, Mar. 23, 1970. 2. New York Times, May 1, 1970. 3. Wall Street Journal, April 8, 1970. 4. New York Times, May 1, 1970. 6. Washington Star, May 6, 1970. 7. Wall Street Journal, April 8, 1970. 8. Wall Street Journal, Jan. 27, 1970. 9. Wall Street Journal, April 10, 1970. 10. Wall Street Journal, April 8, 1970. 11. Wall Street Journal, Apr. 10, 1970. 12. Wall Street Journal, Apr. 13, 1970. 13. New York Times, Apr. 30, 1970. 14. New York Times, May 1, 1970. 15. New York Times Magazine, June 21, 1970, p. 64. 16. Wall Street Journal, July 7, 1970.